Stil no update for xsg UAE.WHY? S8: Is available only for Finland and France(Bouygues)..when release another country?there is section for s8 and S8+ !!! When are Tab A tablets getting updated? Can’t you see this section is not about the TAB A!!! 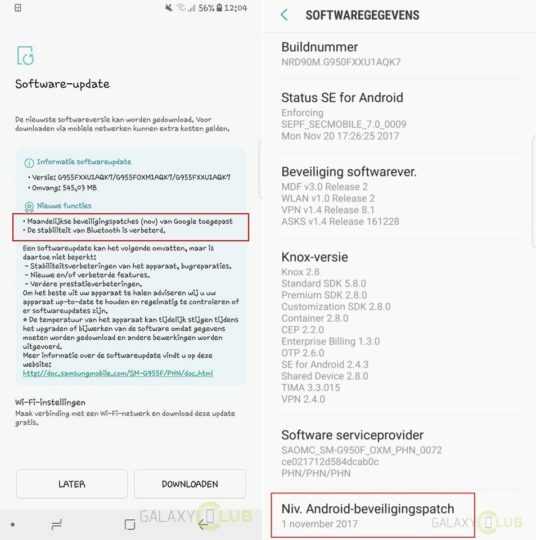 Nice job Samsung, updating all your devices except your most expensive one, the Note8, I haven’t seen a software update on my SM-N950F since August, really sad, they really need to invest more on their software development team. Wait. It will become available, when they’ve uploaded it to all their servers around the world, your phone will tell you when it’s available, Stop panicking and behaving like petulant children. Android security patches are updated every month and my $1200+ Note 8 SM-N950N (256GB variant) still runs on August patch. And FYI there was never a September or October patch. I know you’d say then get a Pixel but I’m a Samsung loyalist which is why it is very frustrating. There are two kinds of smartphone users, one that cares about updates and ones that don’t. So, no one here is acting juvenile but venting out frustration on an online community like sammobile. Brazil not yet G950FXXU1AQK7 update. Wow, what’s happening with Samsung? NOTE8 (N950F) is still in August security patch. Are they waiting for releasing Android 8 Oreo? Same here I have the n950f and still no update !! Anyone knows when It will rollout? I have the feeling we shouldnt have bought this phone.